Welcome to the world of dirt bike jousting, where hillbilly meets class. (Kind of like me when I wear a dress). Trin is in the midst of all her graduating-stuff right now, which means I'm in a state of squealing and sobbing...squobbing? Yep, I'm a big fat squobber. Prom, Grad Night, and then the graduation itself. My baby girl! Alright, that's enough recapping for now. Here's the last 200 words for Black Lilies, chapter three. I swallowed hard, my hands clutching the side of my desk, my stomach stuck somewhere in my throat. Mathematics lesson? I found myself lipping the phrase, though I knew his proper speech should be the least of my concerns. A feeling of panic flooded me at Brett’s words. I couldn’t be the only one who was able to see and hear the oddly-dressed stranger. I couldn’t be. Because that would make me crazy. Or it would mean I was seeing a ghost. Okay. Dirt Bike Jousting is Awesome. And your invitations are so cute! ^_^ I'm determined to host a dinner party one day. So, there are ghosts in the story!! ^_^ I'm trying really hard not to make grabby hands right now. You never hear of "dinner parties" anymore Krystal. I wish we lived in an era where those were still a thing! But yes, you should totally host one. It kind of reminds me of the murder mystery dinners we used to have at our house. We need to have another one of those soon. 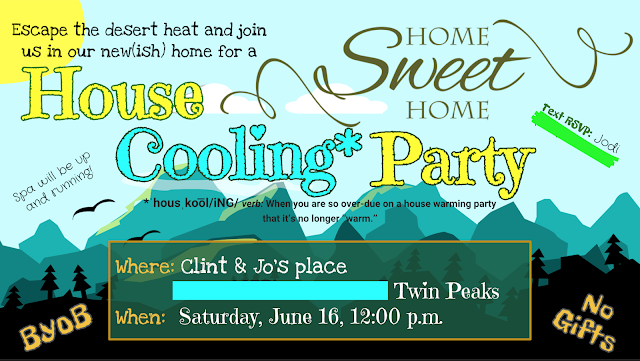 Congrats on your housewarming party! I hope we get to see more pics! Ifeoma! Now I feel like another ghost has popped into this post...YOU. It's so good to "see" you! I hope all is going well with you girly. I miss my very first and bestest CP.